In this week’s two-part blog post, we take a look back at OSU Press author and Oregon State University Emeritus President John Byrne’s November 2000 speech titled “The University of the Future.” As we celebrate Oregon State’s 150th year as a land grant institution, John’s historic words demonstrate the ways in which OSU is living up to its mission to conduct world-leading research, to provide the highest quality education for the people of our state and beyond, and striving to be a “University of the Future” that is making an impact locally and globally. 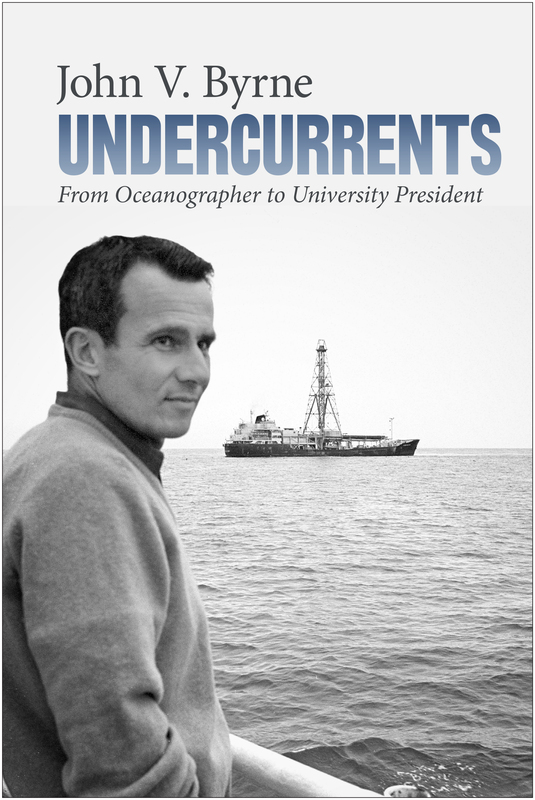 For more on John Byrnes’ philosophy on higher education, check out his newly released book, Undercurrents: From Oceanographer to University President. The challenges to sustain a healthy world population and the opportunities associated with these challenges is greater than humans have ever faced before, and they will continue to increase. But the knowledge needed to address the challenges is also increasing exponentially. It is estimated that the totality of world knowledge doubled between 1750 and 1900, that by 1965 world knowledge was doubling every five years, and that by 2020 the totality of world knowledge will double every seventy-three days. How that knowledge is used will be determined by those who are prepared to use it. Our colleges and universities will be critical to meeting those world challenges and using the newly created knowledge. If higher education is to respond effectively to the challenges created by the world population explosion and the opportunities provided by the rapidly available knowledge it will be required to change the way it operates. Higher education must constantly re-assess the way it functions in order to keep abreast of the rapidly changing world of which it is such an important part. In recognition of the unprecedented speed of change within society and the need for American public universities to be increasingly responsive to the needs of the society they serve, the Kellogg Commission on the Future of State and Land-grant Universities was created with funding from the W. K. Kellogg Foundation. The Commission consisted of the presidents and chancellors (past and present) of twenty-six American public universities. Seven non-academic advisors met with the Commission to provide the citizens’ perspective. The Commission’s goal was to stimulate change and reform through discussion and action on public university campuses. The Commission was created at time when a skeptical public appeared convinced that students were being ignored and that research was more important than teaching, when enrollment was projected to increase significantly at the same time that funding was limited and would continue to be so, when society was facing staggering changes in values and family structure, and when new educational entities, such as community colleges, corporate universities, and for-profit institutions, had entered the student market place. The Commission was to meet four times per year, with the charge to address the reform of American public higher education. The Commission’s first meeting was held in January 1996 and its final meeting in March 2000. At that first meeting the Commission identified five issues for discussion and campus action: The Student Experience; Access; The Engaged Institution; A Learning Society; and Campus Culture. Letter-reports were published regarding each of these issues. Later, a sixth report about the partnership between the public and its universities was published, “Renewing the Covenant: Learning, Discovery, and Engagement in a New Age and a Different World.” The Commission addressed “The Student Experience” first because students are fundamental to the existence of universities. As the Commission considered “Access” it became readily apparent that the issue was really not access or admission to our institutions, but, more importantly, access to a successful life in society resulting from a higher education experience. Access to such a life is affected by admission policies and guidelines, by retention, and by the student’s achievement of his or her educational goals. The Commission’s discussion of “The Engaged Institution” focused on the role of public universities in reaching beyond their campuses and joining in partnership with those elements of society, which benefit from a shared endeavor. In addressing “The Campus Culture” the Commission noted that, in order to be more responsive to the increasingly rapid pace of change in society, universities themselves must change, and must do so rapidly. Their operation must become more effective, more efficient, and more flexible. In the past, as universities have responded to the many demands of society, they have evolved into institutions with many different cultures rather than one single culture: an academic culture, made up primarily of faculty and students, but with subcultures organized around disciplines; a separate student culture; an administrative culture; an athletic culture. A challenge before American universities is to integrate the elements of these diverse cultures into a single all-inclusive campus culture that mediates and bridges the diversity of cultures and is consistent with the aims and mission of American public higher education. In recent years the differences between American private and public universities have become less evident. As state support for public universities has diminished, public universities have turned more and more to private funding. Research universities, both public and private, rely on external funding for support of research. All major universities today provide services to their societies, all are engaged with the public. Although the ideas expressed by the Kellogg Commission apply directly to public universities, most of these ideas apply equally well to private universities. This paper offers guidelines for the successful University of the Future, public or private, in the context of a rapidly evolving global Learning Society, and is based to a considerable degree on ideas expressed by the Kellogg Commission. A learning society is a society that values and fosters habits of lifelong learning and ensures that there are responsive and flexible programs and networks available to address individual and organizational needs. A learning society is socially inclusive and ensures that all of its members are part of its learning communities. It recognizes the importance of early childhood development as part of lifelong learning and develops organized ways of enhancing the development of all children. Further, a learning society stimulates the creation of new knowledge through research and other means of discovery and then uses that knowledge for the benefit of society. It values regional and global interconnections and cultural links, and views information technologies, including all interactive multi-media technologies, as tools to enrich learning. A learning society fosters a public policy agenda that ensures equity and availability of learning for all and contributes to the over-all competitiveness and economic and social well-being of the nation. In the context of a learning society, the successful university of the future will provide learning opportunities for its students, wherever those students may be, and will prepare them for engagement in an ever-changing society, in which the ability to learn throughout each student’s life is essential. In a learning society, lifelong learning is a part of the societal ethos. Seventh, universities must be active participants in promoting civility in the society they serve and must extend their efforts to promote civil societies globally. Universities must affirm these ideals, adhere to them tenaciously, and follow their implications faithfully wherever they lead. Only through such constancy of purpose will the university of the future effectively serve its local society, its nation, and the world. Today Alan Contreras, author of Afield: Forty Years of Birding the American West, co-editor of Birds of Oregon, proofreader for the OSU Press, and private press owner, discusses the process of writing and publishing books. 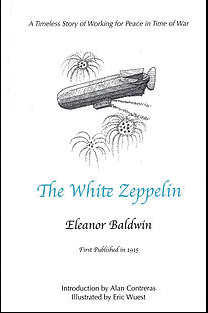 His press, Oregon Review Books, just recently reissued Eleanor Baldwin’s book The White Zeppelin after Alan had the opportunity to proofread Larry Lipin’s new book, Eleanor Baldwin and the Woman’s Point of View for the OSU Press. OSU Press: Briefly describe the books you have published with the OSU Press. Contreras: My five books to date with the OSU Press have been about birds and the natural world. Among these are the huge Birds of Oregon for which I served as co-editor and the more personal Afield: Forty Years of Birding the American West. I’m currently working on an edited collection of essays about the Malheur-Steens region for OSU Press. Down the road I hope to write a history of Oregon ornithology. OSU Press: What originally drew you to observing and researching birds? Can you briefly discuss what led you to compiling these guide and reference books about Oregon birds? How has your fascination with birds blossomed into some of the foremost handbooks for Lane County and Oregon birds? Can you talk a little bit about the process of moving from observer/researcher to author? Contreras: When I was 11 years old—fifty years ago last year—my friend Sayre Greenfield invited me to look at birds. He had received a bird book and binoculars as a gift. I found the variety and behavior of birds fascinating. 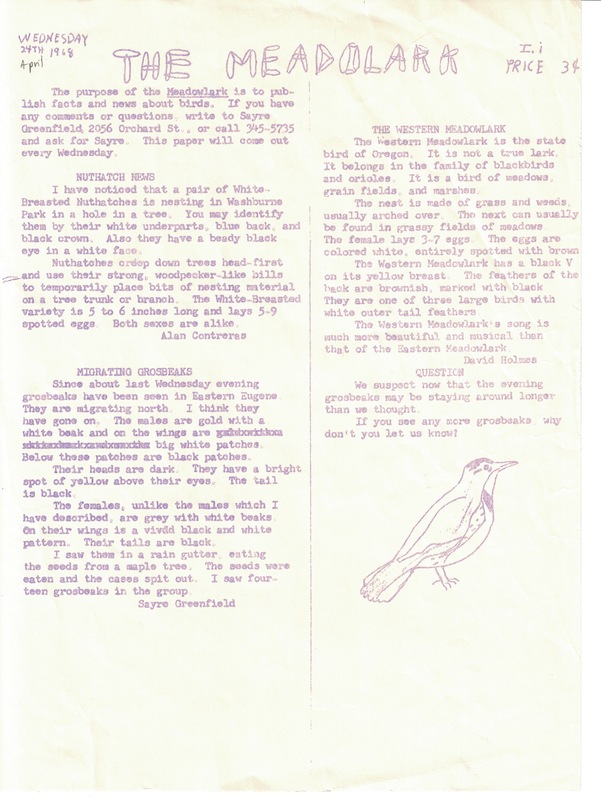 My writing began very early, as Sayre and I decided at about age 12 (we were born the same day) to start our own bird newsletter, The Meadowlark (the historic first edition is shown here—note the misspelled title). Thus I have always been a writer, dating to my earliest days of birding. I was raised to appreciate books and could read pretty well by age 4 or 5, typically far above grade level. There is an old saying that the ability to express himself has kept many a man poor, but in my case it helped offset a lack of other skills such as complete incapacity to do mathematics. OSU Press: What kind of impact did you hope to make with these books? What kind of audiences were you hoping to reach? Contreras: The first one, Northwest Birds in Winter, was intended to fill a gap that existed at the time because bird books focused almost exclusively on breeding activity, habitat, and ranges. Today, Northwest Birds in Winter seems a little crude because the data available online about winter ranges is so much better, but that was not true twenty years ago. Obviously Birds of Oregon, which took five years for many people to write, is the monster book. It was expressly intended to replace and update the Birds of Oregon by Gabrielson and Jewett published in 1940 by OSU. Our senior editor, Dave Marshall, actually knew Gabrielson and Jewett, which added a special note to the project. The other books are smaller special-purpose items. Afield is not a reference at all, it’s a personal essay collection about birding in the west. OSU Press: Why did you publish these books with the OSU Press? What was your experience with the OSU Press? What insights do you have after publishing your books with the OSU Press? Contreras: I had seen many books by the OSU Press over the years (in particular the wonderful Atlas of the Pacific Northwest) and my first book, Northwest Birds in Winter, seemed like a reasonable match for what the press focused on. My experience working with the OSU Press acquisitions and editing staff has been very good. They have not always accepted my initial drafts and through the editing process and external evaluations have helped make everything I worked on much better (though I do grumble now and then.) This was especially true of Afield and will definitely be true of the Malheur collection, which has been a real challenge to assemble, but which I think will be a very successful book over time. In addition, I have worked as a contracted proofreader for the Press for many years and have enjoyed the opportunity to work on some projects other than my own. I think my knowledge of Oregon history and geography has been useful to the press. OSU Press: Please briefly describe your press Oregon Review Books. What is its mission? How did the press come about? Contreras: Oregon Review is the name of the blog I maintained for many years. It still operates in a small way. I retained that name when I decided to do some reprints. These days it is relatively easy to publish small, specialized books in quality paperback form. That’s what I do. I have come across some excellent writing, mostly from a hundred years ago, that I think deserves to be made available to modern audiences but which has such a low demand (and no obvious source of a subvention) that it is impractical to bring to a university press or a commercial press. An example of this is the collected essays of John Jay Chapman on higher education issues. This material, which is astonishingly as applicable today as it was in 1910, was never available in one place—even the superb Collected Works of John Jay Chapman does not include all of his magazine articles. So I assembled this material (and paid a monstrous fee to one of Chapman’s original publishers for one article that was still in copyright) so that it would be available to people interested in his work. The same is true of Pursuit of Happiness, the collected libertarian speeches and writings of the great Oregon lawyer and civic leader C.E.S. Wood (OSU Press has a good anthology, Wood Works, of some of Wood’s other work). I have sold fewer than forty copies of each of these two, but that’s fine—the people who buy them are no doubt overjoyed to find this work available at all. The other purpose of Oregon Review Books is to give me an easy way to publish some works of my own that can’t easily find another outlet. One of these, State Authorization of Colleges and Universities, is the definitive reference in my professional field of college and university degree authority and interstate licensure. It is used by state agencies, law firms, universities, and accrediting bodies all over the country. Even so, its sales are in the hundreds, not the thousands, owing to the arcane subject matter. That small-run niche is one that a private press can fill, especially if it doesn’t need to make a profit. It’s also a way to issue some purely personal items, such as my poetry, in an attractive format. OSU Press: You just recently reissued Eleanor Baldwin’s The White Zeppelin. Why did you decide to reissue this text? Contreras: This was a delightful accident of history. 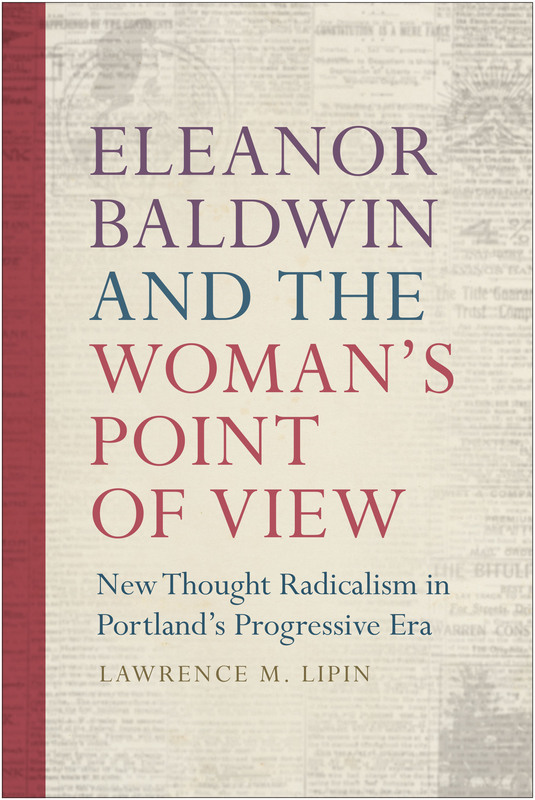 I happened to be assigned Larry Lipin’s biography of Baldwin, which focused on her political activity and writing, as a book to proof for the OSU Press. In the book there is a reference to Baldwin’s short story The White Zeppelin. I was intrigued by the story and dug it up online. I thought it exceptionally well-written and still timely in its anti-war themes. I was raised in Quaker meeting so this felt like familiar territory. Deciding what to reprint requires some sense of good writing and also whether the work still has relevance to today’s readers. Baldwin was a good writer and there are some unique aspects in this story. One of the remarkable scenes involves one soldier saying to another, in effect, “you talk like a woman.” The response is essentially “that’s hardly a surprise, I am descended from women.” My quotes here are not exact but you get the idea. This is a distinctive voice; I don’t think a male writer of that era (or even today) would snap out a great line like that. I arranged for my old friend, Salem artist Eric Wuest. to provide illustrations to jazz it up a little. As a side note, I have also written a poem based on the story, which will appear in my poetry collection In the Time of the Queen in April, 2018. I am never sure whether one of my reprints will find a large audience. The poet James Merrill said he’d rather have one perfect reader than do what was necessary in how he wrote to attract a large audience. I suppose I need to do more marketing, though the luxury of having no overhead or inventory costs means that I can work on these projects without the need to generate constant income. I remain persuaded of the value of print, particularly of the value of books. When my laptop stops working or the so-called “Cloud” gets gummed up or the Internet has one of its hiccup days or North Korea succeeds in poisoning the web, all the electronic files on Earth do us no good. Some of them can be lost forever. That is not true of my library of books, which remain perfectly capable of performing their intended function under almost any conditions short of fire or flood. There is something remarkably solid and reliable about a book. I am glad to have been able to work with the OSU Press and to make my own small contribution to the world of books. In honor of the Pacific Northwest Booksellers Association 2018 Book Awards announced this week, and to celebrate OSU Press author Brian Doyle’s posthumous recognition with the 2018 “Indie Spirit Award,” we thought we would take a moment to look back at some of our award winning titles and authors. We hope you enjoy these books as much as we do! *Please note: this list is in no particular order nor is it comprehensive. Renowned author Jarold Ramsey was this year’s winner of the Oregon Book Awards C. E. S. Wood Distinguished Writer Award. He has published three books with the OSU Press. Notable author Jarold Ramsey’s newest book Words Marked by a Place, slated to be released this spring, is a book of interconnected writings reflecting on the human and natural history of central Oregon. This chronological collection presents the reader with key episodes of central Oregon history, from nineteenth-century exploration to the railroading and homesteading era to the era of community-building and development that followed. Distinguished writer Jarold Ramsey authors New Era, a graceful and literate collection of personal essays on the human and natural history of the Oregon high desert, focusing on what happened to the people and the land of this region during and after the homesteading era of 1900 to 1920. It is a book full of stories-about early Indian/Anglo connections, about the ghost town of Opal City, about homestead ranches and the families who struggled to make their lives there. 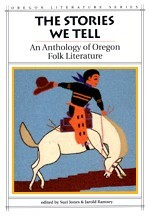 Jarold Ramsey and Suzie Jones co-author the first anthology of Oregon folk literature collecting cherished traditional stories and songs, myths and sayings, that have nurtured and informed the state’s best writings. Oregon's written literary heritage owes much to what Oregonians have told and sung and kept in memory, in kitchens and sweat-lodges, on the range and on the street, in canneries and convention centers, in schools, bunkhouses, and funeral parlors. This book celebrates a literature that has been sustained by the artistry and imaginative generosity of countless Oregonians, past and present, with stories to share. This 2017 Oregon Book Award and WILLA Award finalist in the nonfiction category uses the story of Tsagaglalal, or “She Who Watches,” an ancient female chief, as a guide to show that even though women were barred from positions of public authority until recently, they have always worked quietly and informally to assure the stability and security of their families and communities. 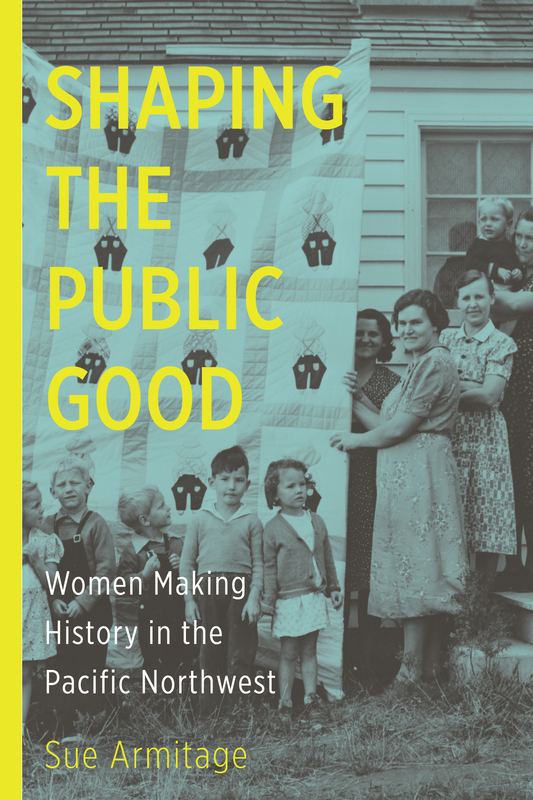 Women’s community-building and cooperative skills have been decisive in developing the societies of the Pacific Northwest—Washington, Oregon, Idaho, western Montana, and British Columbia. Like She Who Watches, women have never been mere observers, but watchful guardians and active shapers of the public good. The American Association for the Advancement of Science’s 2017 Best Hands On Science Book, Ricky’s Atlas, Mapping a Land on Fire is the sequel to Ellie’s Log: Exploring the Forest Where the Great Tree Fell. This children’s book follows Ricky Zamora as he brings his love of map-making and his boundless curiosity to the arid landscapes east of the Cascade Mountains. He arrives during a wild thunderstorm, and watches his family and their neighbors scramble to deal with a wildfire sparked by lightning. Joined by his friend Ellie, he sees how plants, animals, and people adjust to life with wildfires. Ellie’s Log, by notable scientist and author Judith Li and illustrated by Peg Herring, received an Honorable Mention from the John Burrough’s Society. This book is an engaging blend of science and storytelling. After a huge tree crashes to the ground during a winter storm, ten-year-old Ellie and her new friend, Ricky, explore the forest where Ellie lives. Together, they learn how trees provide habitat for plants and animals high in the forest canopy, down among mossy old logs, and deep in the pools of a stream. The plants, insects, birds, and mammals they discover come to life in colored pen-and-ink drawings. Sharman Apt Russell received the 2016 John Burroughs Medal for her book Diary of a Citizen Scientist. 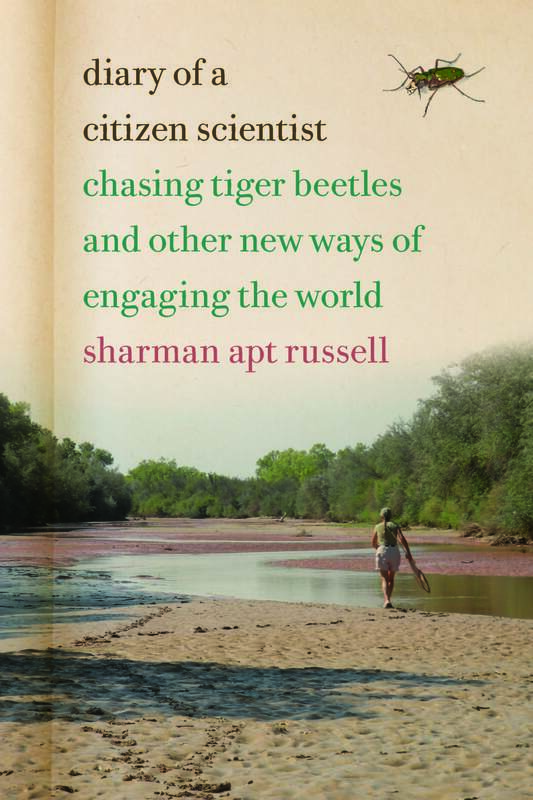 This timely exploration of the phenomenon of citizen scientists is told through the lens of nature writer Sharman Apt Russell’s yearlong study of a little-known species, the Western red-bellied tiger beetle. In a voice both humorous and lyrical, Russell recounts her persistent and joyful tracking of an insect she calls “charismatic,” “elegant,” and “fierce.” Patrolling the Gila River in southwestern New Mexico, collector’s net in hand, she negotiates the realities of climate change even as she celebrates the beauty of a still-wild and rural landscape. Kurt Fausch, stream ecologist and award recipient of the 2016 Sigurd F. Olson Nature Writing Award, ponders both the science of rivers and streams but also the larger questions of why rivers are important to humans, why it is in our nature to want to be near them, and what we can do now to ensure the future of these essential ecosystems in his book For the Love of Rivers. 2016 Geological Society of America fellow, Dawn Wright, co-authored her book Place Matters Astrid Scholz and published it through the OSU Press. Co-authored by distinguished scientists Dawn Wright and Astrid Scholz, this book discusses how marine geographic information system (GIS) is contributing to the understanding, management, and conservation of the shores and ocean of the Pacific Northwest, where scientists, resource managers, and conservationists- often in collaboration- are making advances in the way that data are collected, documented, used, shared, and saved. 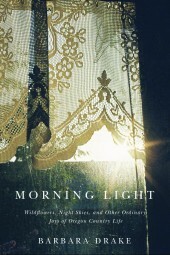 Morning Light, a 2016 Oregon Book Award finalist, examines the life lessons Barbara Drake has learned in her long stint of country living. As entertaining and instructive as it is personal and reflective, Drake’s writing highlights her appreciation for the landscape of western Oregon and the reasons we should care for our rural landscapes. Tim Palmer does due justice to Oregon’s pristine network of waterways in this 2016 Oregon Book Award finalist. Field Guide to Oregon Rivers offers all audiences an interpretive approach to 120 rivers and streams throughout the state of Oregon, highlighting their natural history, geology, climate, hydrology, plants, animals, and ecology and showcasing their beauty with 150 award-winning photographs. 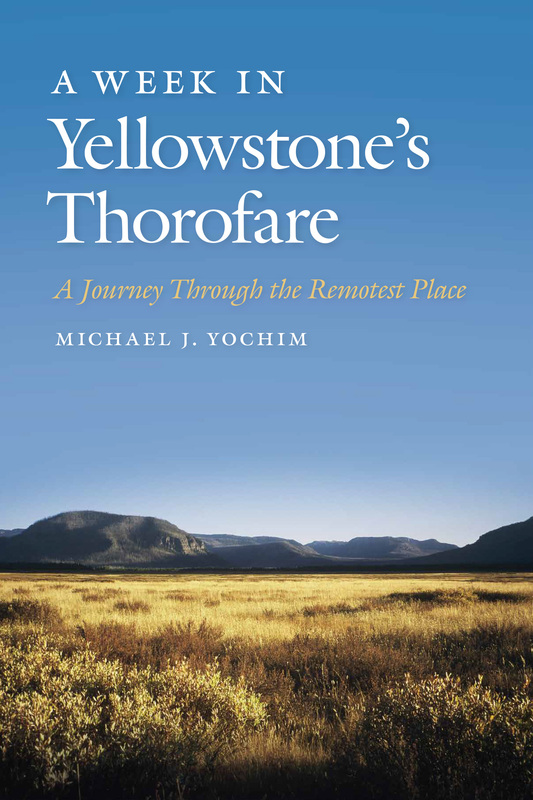 A Week in Yellowstone’s Thorofare, a finalist for the 2017 High Plains Book Award in the nonfiction category, explores Michael Yochim’s weeklong expedition in the remotest place in the country, outside of Alaska, ironically named the Thorofare for its historic role as a route traversed by fur trappers. Drawing on first-person accounts of rangers who have patrolled this region in Yellowstone National park, archival documents, and Yochim’s personal experiences over almost three decades, this book distinguishes between the notions of wildness and wilderness and argues that wildness is the most precious, and easily lost, attribute of wilderness. Named a 2016 Stonewall Honor Book by the American Library Association, Marie Equi explores the fiercely independent life of an extraordinary woman. Equi self-studied her way into a San Francisco medical school and then obtained her license in Portland to become one of the first practicing woman physicians in the Pacific Northwest. She leveraged her professional status to fight for woman suffrage, labor rights, and reproductive freedom and broke boundaries in all facets of life by becoming the first well-known lesbian in Oregon. Beloved Oregon author Brian Doyle received this year’s Pacific Northwest Booksellers Association 2018 “Indie Spirit Award.” He published four of his works with the OSU Press. 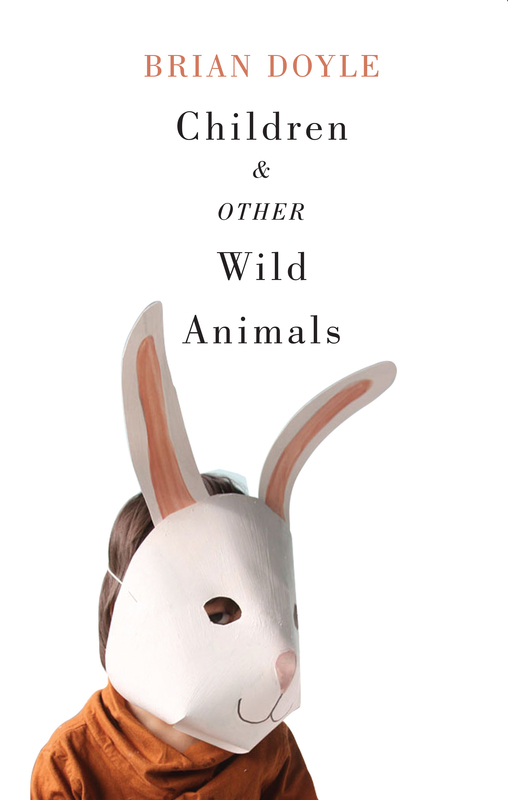 Renowned author Brian Doyle’s collection of delightful, short vignettes pondering animals and human mammals of all sizes won a 2016 Pacific Northwest Booksellers Association Book Award. Doyle explores the seethe of life on this startling planet, the astonishing variety of our riveting companions, and the joys available to us when we pause, see, savor, and celebrate the small things that are not small in the least. In this poignant and startlingly original book, Brian Doyle examines the heart as a physical organ—how it is supposed to work, how surgeons try to fix it when it doesn’t—and as a metaphor: the seat of the soul, the power house of the body, the essence of spirituality. In a series of profoundly moving ruminations, Doyle considers the scientific, emotional, literary, philosophical, and spiritual understandings of the heart—from cardiology to courage, from love letters and pop songs to botany and Jesus. Weaving these strands together is the torment of Doyle’s own infant son’s heart surgery and the inspiring story of the young heart doctor who saved Liam’s life. This 2011 Foreward Review’s Editor’s Choice Prize-winning novel is Brian Doyle’s stunning fiction debut that brings a small town on the Oregon coast to life through the jumbled lives and braided stories of its people. There are love affairs and almost-love-affairs, mystery and hilarity, bears and tears, brawls and boats, a garrulous logger and a silent doctor, rain and pain, Irish immigrants and Salish stories, mud and laughter… It’s the tale of a town, written in a distinct and lyrical voice, and readers will close the book more than a little sad to leave the village of Neawanaka, on the wet coast of Oregon, beneath the hills that used to boast the biggest trees in the history of the world. A self-described "wine doofus," Brian Doyle chronicles his year in one Willamette Valley vineyard, exploring the creative and chaotic labor of making the perfect pinot noir. Doyle serves as a cheerful tour guide through the world of wine, alert to the colorful and riveting stories that swirl around its creation and consumption, and sharing these stories about the natural history of the vineyard, the fussiness of the pinot vine, the boom in pinot noir around the world, the surprising buying habits of tasting room visitors, and the subtle craft of winemakers who know, as Jesse Lange says, grinning, "how to get out of the way of great grapes. Be sure to pick up one of these prized titles to keep you company while waiting (perhaps im-) patiently for our soon-to-be released Spring 2018 books! OSU Press author Michael Helquist had the opportunity to present at the unveiling of the mock-up of Marie Equi’s plaque for San Francisco’s Rainbow Honor Walk. Michael’s biography, Marie Equi: Radical Politics and Outlaw Passions, explores the fiercely independent life of an extraordinary woman who used her professional status as a physician to fight for woman suffrage, labor rights, and reproductive freedom and was the first well-known lesbian in Oregon. Marie Equi’s inclusion in San Francisco’s Rainbow Honor Walk is a well-deserved honor commemorating her unparalleled life journey. The Rainbow Honor Walk is an all-volunteer project based in San Francisco’s LGBTQ community. Begun in 2011, the organization funds production and placement of the bronze plaques through community outreach and private donations. (Each plaque costs about $5,000.) The City and County of San Francisco collaborates with planning and installation and the city’s art commission approves the design. Artist Carlos Casuso of Madrid, Spain was selected to design the plaques following an international design competition. The first 24 plaques were installed mostly along Castro Street in the city’s LGBTQ neighborhood, and then organizers extended the route on either side of Market Street with the next batch of twenty-four plaques. Although Marie Equi’s reputation extends beyond the Pacific Northwest, she was not particularly well known in San Francisco’s activist, women’s, and LGBTQ communities. Her recent biography significantly changed that. For more information on Marie Equi see michaelhelquist.com and for the Rainbow Honor Walk see rainbowhonorwalk.org.